The three highest of the Cheviot Hills cluster around the upper reaches of the Harthope Burn, peering down into the narrow valley below. 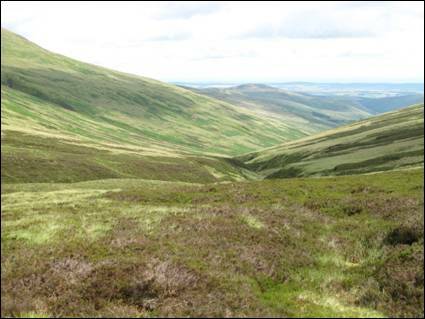 The Cheviot, at 815 metres, is the highest of these three hills and is also England`s highest hill north of Cross Fell. It is a whale of a hill and, as Northumberland`s premier hill, it is a must to climb. The second highest, Hedgehope Hill, is a majestic hill, and when viewed from the Harthope Valley, is perfectly conical. The third and final hill of the trio, Comb Fell, is a hill of little consequence although its height and its relative remoteness make it an attractive destination. This walk takes you on a horseshoe shaped journey across all three of these high hills, crossing en route the watershed of the Harthope Burn. This is a classic Cheviot route. The rewards are extremely high. 1. 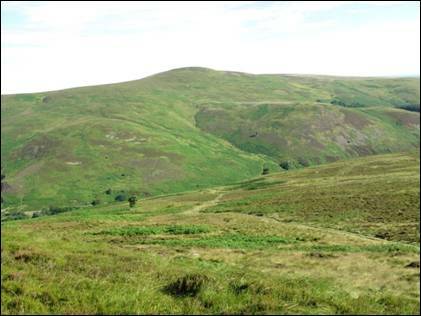 The Harthope Valley lies south west of the north Northumberland town of Wooler and is the perfect place to start your journey across these high Cheviot Hills. An interesting 5 mile drive into the valley, via the oddly named steep hill, Skirl Naked, will lead you to a point where the Hawsen Burn meets with the Harthope Burn. Here there is adequate roadside parking (NT 953225).Sitting beside the Hawsen Burn is a circular stone sheep stell, so shaped to prevent snow drifting. There are numerous such stells in the Cheviot Hills. On the other side of the single track road, a signpost points the way to Housey Crags and your first hill of the day, Hedgehope Hill. A short stretch of path, adjacent to a stone wall, leads you to a small wooden footbridge over the Harthope Burn. A quick climb through the trees and soon you emerge into the open where the impressive Housey Crags tower above you. Once across the step stile, a fairly steep climb up a clear, green path will all too soon bring you alongside and then behind the crags. If energy levels permit, a quick scramble to the top of the crags will be well rewarded. These are probably the best known and most frequently visited of all the Northumberland crags. 2. Continue to follow the path, aided occasionally by a directional fingerpost, onto Long Crags which at their highest point are more than 420 metres above sea level. From here there is a tremendous view of much of the way ahead. The shapely Hedgehope Hill, with Threestoneburn Wood clinging to its eastern flanks, can be seen across the flat expanse of Kelpie Strand. Across the valley, the Cheviot displays its long, broad back and rubs shoulders with its smaller neighbour, Scald Hill. The adrenalin begins to pump! Once across the crags and the step stile (NT 956213) the cotton grass rich moorland of Kelpie Strand makes pleasant walking as you now head towards the `cone` of Hedgehope Hill. On reaching the 450 metre contour, the path begins to swing towards the south-west as the serious climbing gets underway. 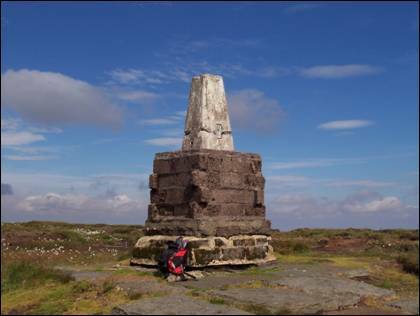 The gradient steepens as you gain over 260 metres in height in just over half a mile of walking, before finally reaching the 714 metre high summit of Hedgehope Hill. 3. This is certainly the most shapely and distinctive of all the Cheviot summits, a place where three fences meet beside a jumble of small stone shelters, all of which are topped off, like a giant cake, by a triangulation pillar. The views in all directions are outstanding so take time to `circumnavigate` the stone top. On 8th April 1941 three High Explosive bombs fell one mile to the south of Hedgehope Hill, in the vicinity of the Het Burn. The craters were reported as being 66 feet wide and 30 feet deep. Three years later, on 15th May 1944 a Bristol Beaufighter aircraft was on a night time navigational exercise when it crashed into the upper eastern slope of Hedgehope Hill. Both Belgium crew were killed. 4. Time now to head in a west south west direction on a 1½ mile journey to the unspectacular top of Comb Fell. Keeping the post and wire fence to your left, an easy downhill stretch leads very quickly to the lowest point between the two hills. Here you will, for a short time, need to pick your way through peat hags and across potentially boggy ground. There is no real difficulty although you will need to concentrate if you are to avoid the many pitfalls that lie in wait for the unsuspecting walkers. Also, whilst you keep your eyes on the ground be sure to keep them peeled, during the summer period, for the occasional pink fruit of the cloudberryplant. Once past this area, the gentle gradient, which (as at summer 2016) runs alongside a stretch of geo-textile mesh which has been laid as part of a conservation trial and soon brings you, at 652 metres, to the eastern summit of Comb Fell. It is barely noticeable! Continue with the fence across the flat and generally wet top and then descend slightly until you reach a fence which rises up from the Harthope Valley, below you to your right. At this point (NT 915185) and without crossing the fence, you must leave the high ground as you head north westwards along the fence line to the watershed of the Harthope Burn. But first, why not continue with the curve of the fence for a short distance, crossing a gate en route, to visit the rocky `pyramid` ahead; Coldlaw Cairn. 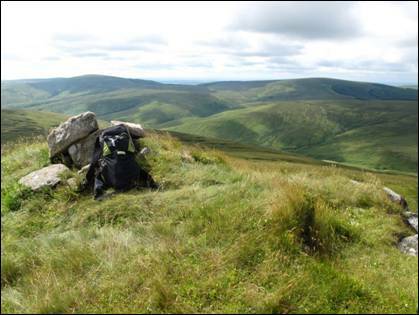 Here you will feel a real sense of remoteness whilst looking down towards the infant River Breamish. It is not obligatory, but you will not be disappointed. It is a tremendous vantage point with great views to Windy Gyle, Cushat Law, Bloodybush Edge, Hogdon Law, Shill Moor and much more. It is a difficult place to leave. Retrace your steps and once back across the stile follow the fence towards the head of the Harthope Burn. Whilst the going is reasonably easy, there are two fairly substantial peat hags to negotiate, so be prepared to use your hands and take care. The watershed area is known as Scotsman`s Knowe and soon you are rising again towards Cairn Hill. 5. When you reach the directional fingerpost, take a deep breath and, keeping the fence to your left, begin the steep climb towards the top of Cairn Hill, the south western outhill of the mighty Cheviot. 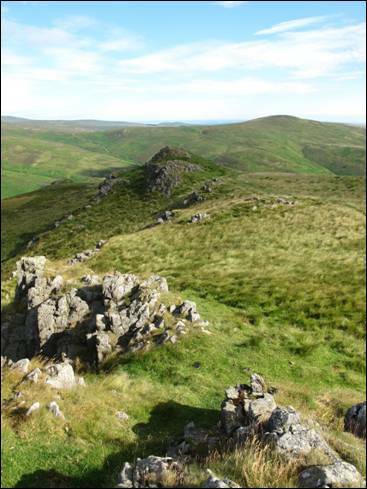 At 777 metres high, Scotsman`s Cairn (NT 903195) is a splendid viewpoint. Across the valley the ridge between Hedgehope Hill and Comb Fell dominates the view as wave after wave of hills roll away to the south. Across the step stile, the signpost points to the west and the Pennine Way. To the north-west the stone men of the distant Auchope Cairn can be seen standing guard over the magnificent cleft of the Hen Hole. Perhaps a walk for another day! Now you must turn right to make the short journey to the summit of the Cheviot, the highest of all the Cheviot Hills. Once you have passed the small lough, the huge triangulation pillar can soon be seen ahead as you now make your way easily along the stone pathway. This is the third such pillar to have stood on this lonely spot, the previous two having long since sunk into the peat. The summit plateau of the Cheviot consists of blanket bog and has been designated, along with a large part of the surrounding area, as a Site of Special Scientific Interest. Continue along the stone pathway and then over the ladder stile at the eastern end of the summit plateau. Continue to follow the fence as it starts its descent towards Scald Hill. As you head steeply downwards, there are fine views down to the Harthope Valley and beyond to the Northumberland coast. 6. Immediately after a short col, a quick and easy climb brings you to the top of the 549 metre high Scald Hill, just after you have crossed over a small step stile. The actual top lies just across the post and wire fence where there are good views down into the quiet Lambden Valley and across to Broadhope Hill and Cold Law. After a further short descent of just under 600 metres it is time for you part company with the guiding fence. At the point where the fence makes a pronounced turn to the left (NT 933222) you must head half right following either of the two almost parallel tracks towards the Harthope Valley. The left hand track is the preferred option although both eventually merge further downhill. Your route back to the valley floor now takes the right hand spur and continues downhill in a generally easterly direction with outstanding views onwards to the valley and beyond. To your left, Blackseat Hill stands behind the New Burn, whilst to your right, Hedgehope Hill reminds you of your earlier efforts. The numerous crags you can see include, Langlee, Middleton, Housey and Long, two of which you will have already visited on this walk. Now enjoy the rest of the comfortable descent and when you eventually arrive at a small plantation keep with the gravel track as it turns right to join with the valley road. Now turn left for the few hundred metres stroll back to the Hawsen Burn. The Harthope Valley has been described as, “one of the most picturesque and unspoilt valleys in Northumberland, a favourite with birdwatchers and walkers“. As you wipe the sweat from your brow, this is your moment to enjoy the delights of this tranquil valley.